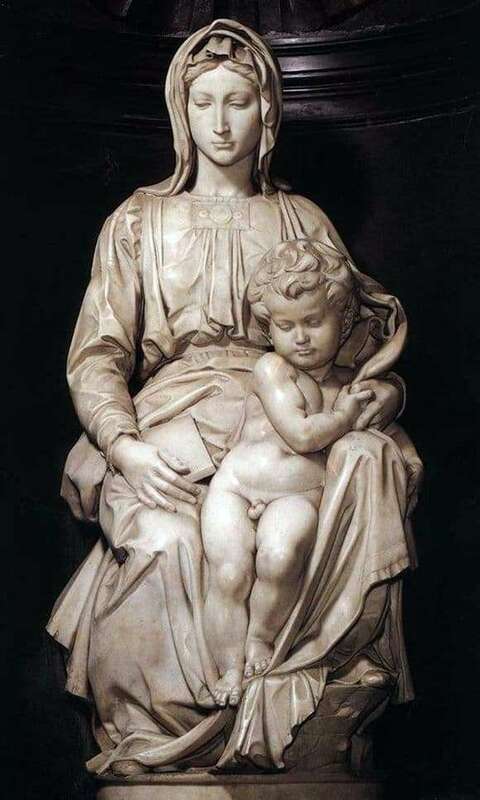 The Madonna of Brugge is the only work by Michelangelo who left Italy during his lifetime, going to the church of Notre Dame in Brugge, a town, after whose name she received the name. It is made of stone, its height is 128 centimeters, and the sculptor, working on it, was obviously not guided by church canons. Usually, in the images of Mary and the Baby, Mary presses him to her, as if to hide from the world and future destiny – at least for a while. Here she holds the child relaxed, just sitting between her knees and holding it with one hand, while she herself looks a little to the side, becoming interested in something else. Perhaps he is thinking about something earthly, simple, like thinking about how much bunch of greens you need to buy for soup, and, perhaps, he sees the future fate of his son, but knowing its inevitability does not grieve for it and does not try to prevent it, but simply looks at it with a pensive and sad expression on its face. Little Christ, like in all images curly, also does not look like his usual image. As a rule, he is portrayed younger, quite a baby, not learned to walk yet. Here he is about two years old, and he is interested in the world around him. Curiosity is felt in his eyes. In the way he gently slides off, trying to reach his foot to the floor, one can see the usual children’s trick, which consists in the apparent invisibility of maneuver. He is not like God, just as his mother is not like a woman who gave birth to God, but like an ordinary child who is passionate about something and wants to catch and consider something. The world is waiting for him, earthly, breathing, alive and real, and only the mother’s hand makes him sit still, without running away and fully immersed in the usual children’s fun, like playing in the sand or with their peers. However, despite the freedoms, the church accepted the work of the master favorably.